Rent Bukarest Appartment with EastComfort. 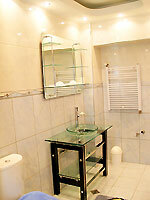 Our agency manages over 50 quality appartments for rent in Bukarest. 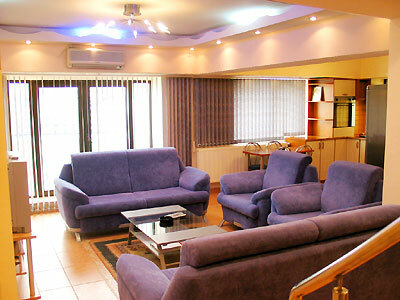 Select an appartment in Bukarest by price, the number of guests or by our recommendations. Unirii Square, RENTED FOR LONG TERM!!!! Deluxe 2 story Bukarest appartment, only 2 minutes leisurely walk from the heart of Bucharest is available for rent and provides lodging for up to 6 people. On the first level, the entrance leads to a large living-room (with a pleasant balcony view upon the river), trendy furnished with 2 sofas, 2 armchairs, a cofee table in the middle, a warmly furnished bedroom and an equipped kitchen (large fridge, gas cooker, dinning table with chairs, full sized cupboards, ustensils). On the second floor, you can enjoy the other two bedrooms. One for each level of the duplex, the bathrooms come along with the newest type of jacuzzi, basins, shower cabin and lavatories. The outstanding flat will make you came back. Nestled in the centre of Bukarest in the Unirii Square, 30 m walking distance from Unirii Shopping Center, Splai Side, the duplex offers all you search for, from romantic settings to trade centers. Casa Poporului -exquisite views from the flat's terrace.